← What have the Syrians ever done for us…? I have deep respect for the immense learning, skills, and achievements of many of my academic teachers as well as other scholars with whom I was fortunate enough to cross paths at various stages of my professional life. An example of this is my irrationally profound admiration for the late Géza Alföldy‘s repeatedly proven skill in restoring ‘ghost inscriptions’ from pin holes – interpreting the cluster of pin holes once used to attach metal letters to monumental surfaces and thus allowing for ancient texts that could not be read for centuries to be studied again. Jubilee Cross, Reading. — Photo: PK, September 2015. The structure is a Grade II listed building and described as a ‘jubilee cross’. Jubilee Cross, Reading: Inscription. — Photo: PK, September 2015. The inscription, once mounted to the surface with small metal letters in a typical local fashion, has almost entirely disappeared – all that is left are a few traces of letters in the very final line of this inscription that was written over seven lines. were brought to a successful completion. The year of the Jubilee of Queen Victoria. Isaac Harrinson Esq. was a surgeon, who resided in Reading’s Castle Street for the better part of the 19th century, and his benefactions as well as his medical writings are well documented. Isaac Harrinson Esq. – Photo courtesy of David Ford (www.berkshirehistory.com). The Jubilee Cross, designed by Slingsby Stallwood, is conceived as one of the ‘monuments in St. Mary’s Butts’ that were successfully completed in 1887 – it thus sits alongside the entirely secular Jubilee Fountain on the island of St. Mary’s Butts and (one may infer) the then only recently completed refurbishment of Reading Minster itself. 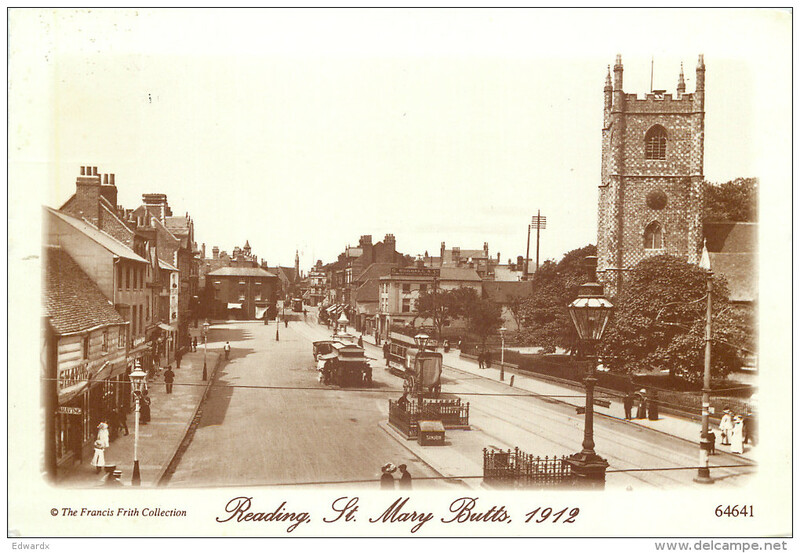 View of St. Mary’s Butts, 1912. – Image source here. In conjunction with the Jubilee Fountain and the statue of Queen Victoria at St. Laurence Church (about which I have written in my recent book The Writing on the Wall: Reading’s Latin Inscriptions), the Jubilee cross is thus a third monumental structure to commemorate the golden jubilee of Britain’s now second-longest serving monarch in Reading. 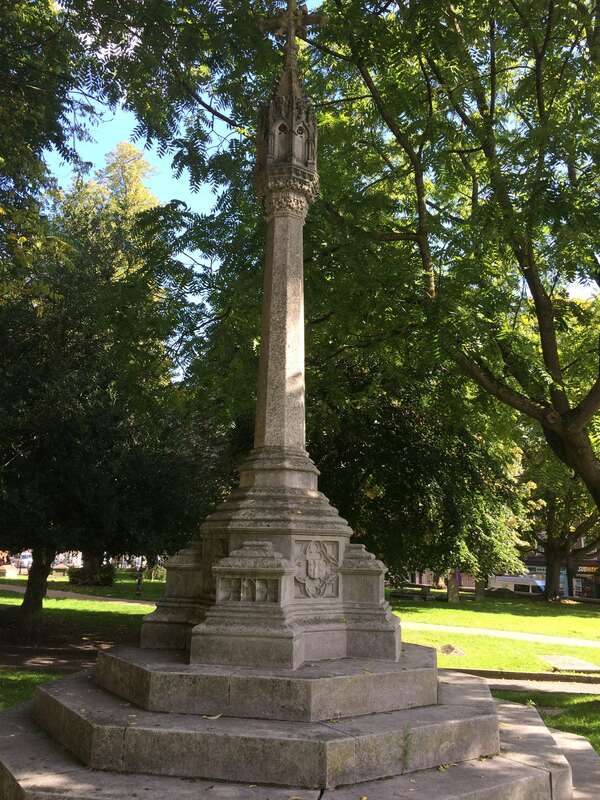 With its largely vanished script, the Jubilee Cross is, however, also a memorial to Reading’s continuing reluctance to honour its past and to preserve its collective, cultural memory. Postscriptum. An earlier version of this blog post gave the benefactor’s name as Isaac Harrison (rather than Harrinson). I am grateful to David Ford, who also kindly provided the photograph of Harrinson. And while I am at it, I highly recommend his webpage www.berkshirehistory.com! 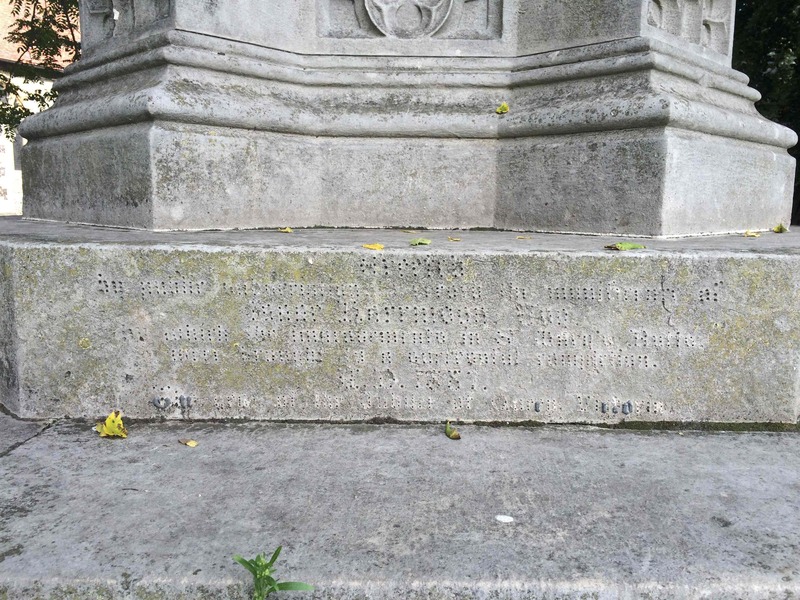 This entry was posted in Epigraphy, History of Reading, Prose and tagged History of Reading, Jubilee, Local history, Memory, Public History, Queen Victoria, Reading, St. Mary's Butts. Bookmark the permalink.